Dragging salutations for the New Year half way through January may be stretching the point just a little too far, but I was otherwise engaged during my last post where best wishes for 2015 would best have been wished. In fact, 2015 dawned without me (I am ashamed to admit). While all good birders were out making first submissions on eBird 2015, I was nursing a sore head and struggled to make it out by mid-afternoon. But God loves a sinner it would appear. As this prodigal birder returned from his excesses and weakly raised his Bushnell’s, 2 Lesser Moorhens skittered across a small pond and disappeared into the weeds on the far side. Technically, my first bird of the year was a Laughing Dove which was rudely awakened from its roost in the hotel garden by the midnight fireworks and crash-landed by the pool. 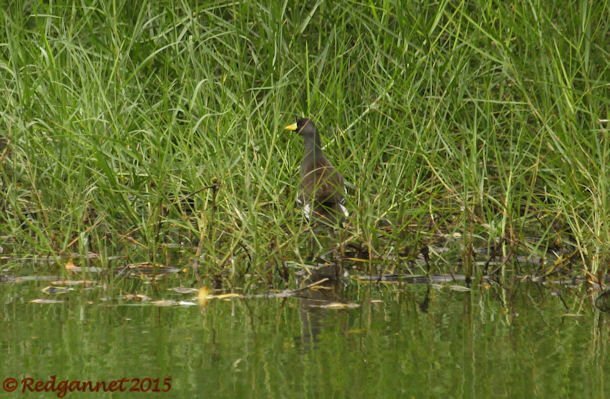 As far as eBird is concerned, my 2015 campaign started at 14.30 in the Botanical Gardens of the University of Ghana. and included a lifer rallid. Hopefully the photography will improve as the year progresses. Happy New Year, Redgannet! May you get many more lifers and wonderful birds.